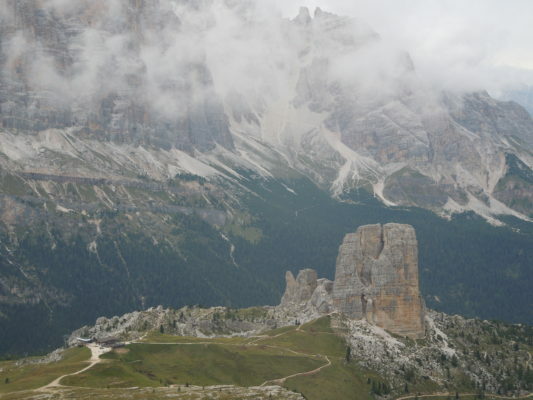 Here’s a bit of historical background before I tell my story: The Dolomites are in the Italian Alps. Prior to World War I, they were part of the Austro-Hungarian Empire. Italy waged a fierce battle for the region during three years of war in which thousands on both sides died. The fighting ended in a stalemate. By treaty, this mountainous area became part of the South Tyrol region in Italy. Much of the population is culturally Austrian and speaks German. The Dolomites were designated a UNESCO World Heritage Site in 2009 because of their natural beauty and unique formations. There are nine different areas of note and all have distinct and dramatic shapes and colors. On each of our hikes, we saw stunning and extraordinary landscapes. And on the day of our fifth hike, we experienced the unexpected. For the first two hikes, the weather was splendid, sunny, and warm, the scenery unsurpassed, the trails challenging. The second two hikes were all of the above except rather than sunny and warm, the weather was cool, overcast, misty and moody. The night before our fifth hike, we stayed at a hotel located in a pass 7,345 feet in elevation. Rain had threatened all day but we finished our hike without a drop falling. While having dinner, it started to pour, the temperature turning very cold with snow threatening. The plan for the following day was to hike to the highest point on the trip, a summit of 10,334 feet. Since there was a very real possibility of snow overnight, the group came up with a few alternative ideas just in case. Jokingly, I suggested bowling, and was told that indeed, there was a bowling alley in the next village. Bowling in the Alps-who knew? But I digress. When I awakened in the morning and looked out the window, this is what I saw. 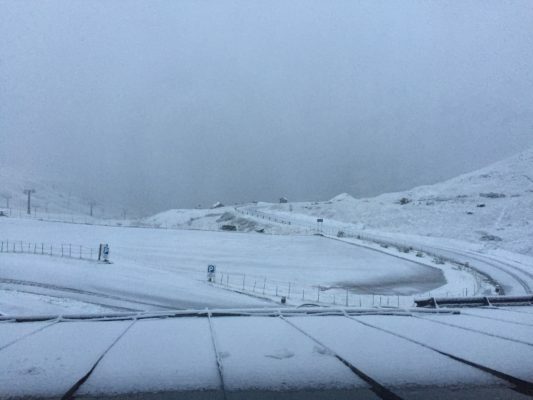 Yes, a winter wonderland in mid-September! Clearly, an alternate plan for the day’s activities was in order. 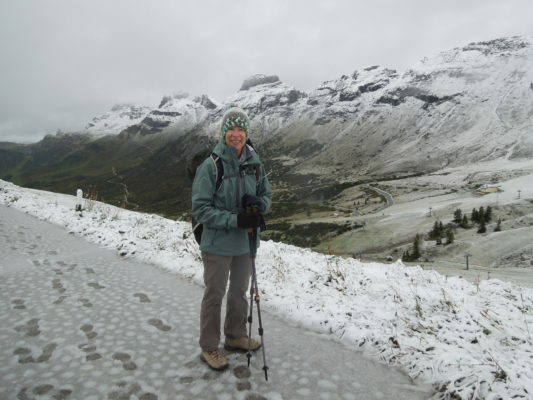 Some of us thought this would be a nice opportunity to curl up with a good book by a warm fire in the hotel, but our most able guides, Tomi and Claudia, had a more energetic solution: we would hike in the snow! So we bundled up in our warmest clothing and carefully exited the hotel on foot. We started gradually going uphill in the wet slush. After visiting a war memorial to local soldiers who died in World War I, we crossed the road and walked single file on a very muddy, slippery trail. We saw a large herd of dirty, wet sheep vacate a patch of ground where they had spent the night and decided that would be the most direct path to our ultimate destination, a gondola that would take us down the mountain to the town of Araba where we were to have lunch. This trek entailed stepping in vast quantities of sheep poop which, along with the mud, made for some very messy boots. Then it was onto a steep gravel path that seemed endless. 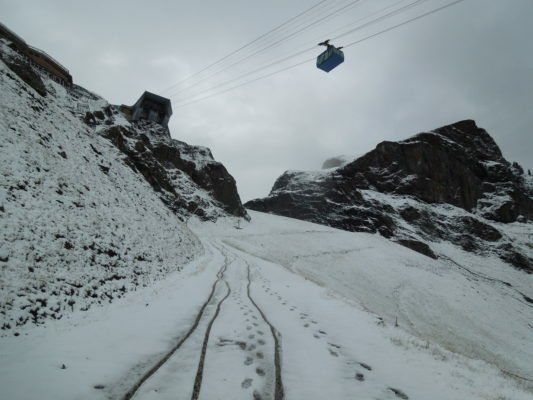 When it looked as though we had finally arrived at the gondola, we were extremely dismayed to find out that this was not the correct one and that we had another 1500 feet of elevation to gain. By now we were hiking in deeper snow and the going was increasingly arduous. We arrived breathless at the gondola station. The thing was that our dear guides had neglected to inform us in advance about the precipitous grade, likely out of fear we would resist such a plan given the weather conditions. Meanwhile, on the bright side, the clouds had lifted somewhat. 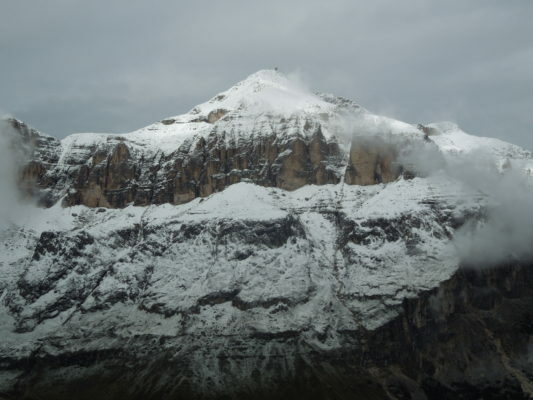 The views to the surrounding peaks, including Marmolada, the highest mountain and the only large glacier in the Dolomites, and also Piz Boe, the summit we were supposed to reach had it not snowed, were quite sensational. And the entire experience, while demanding, was also so much fun. For me, this was the most unforgettable day of the trip because it was delightfully unexpected! Hello Adele, I hope you had a safe journey home. Awesome to read your postcard. I am so happy we met on this trip and look forward to seeing you again. Claudia, It was indeed a most memorable trip: so much packed into a short time, so many more stories to tell, pictures to share. And thank you for being such an effective, knowledgable, and warm leader. Let’s do travel again together! Have a great time in Greece with your family. I love hiking with you again, even if it is vicariously. Wow. 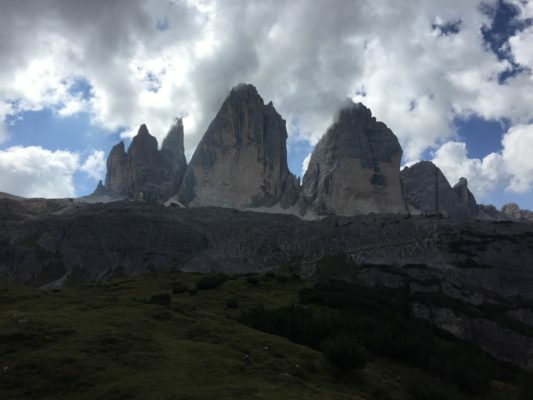 What an adventure this Dolomite trip turned out to be. I do hope that our trails will cross again. Linda, I’d be happy to hike with you anytime!